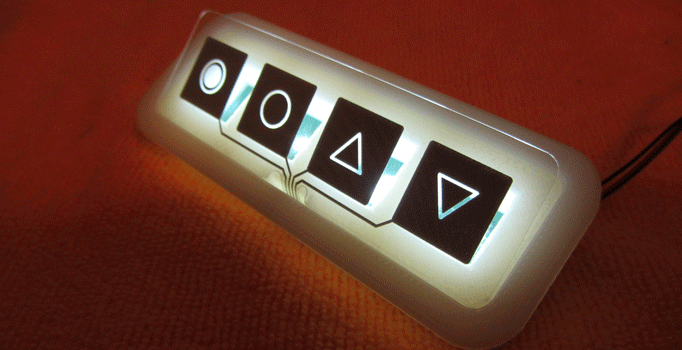 The Film or Membrane keypad has the capacitive touch sensor pads printed on a thin flexible film. 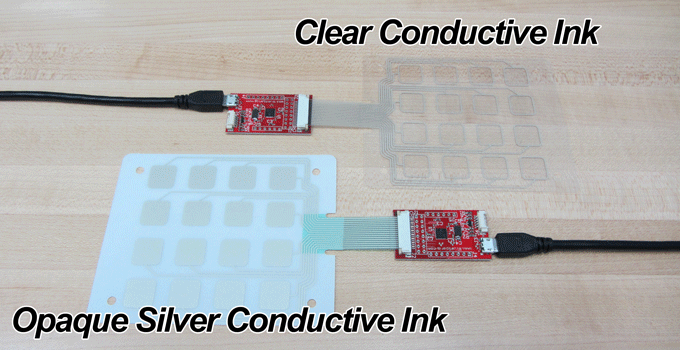 The sensors can be made using conductive silver ink or special clear / translucent conductive inks as well as ITO. We have also started experimenting with nano-wire touch sensors. The film has a ZIF tail which is plugged into the capacitive touch driver electronics. The overlay is non-conductive and placed on top of the circuit layer. The overlay material could be glass, lexan, acrylic or any other plastic of various thickness. When the human hand is brought in close proximity to the pads of the circuit layer, the capacitance associated with the pad changes. This causes a change in the voltage measured on the pads. This change in voltage is registered as a button press by the Fast Touch system. 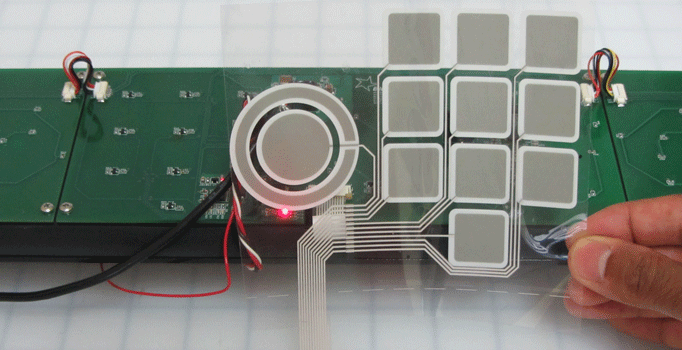 Rapid Keypads can produce the touch sensor membrane / film by itself, or with a graphic overlay. 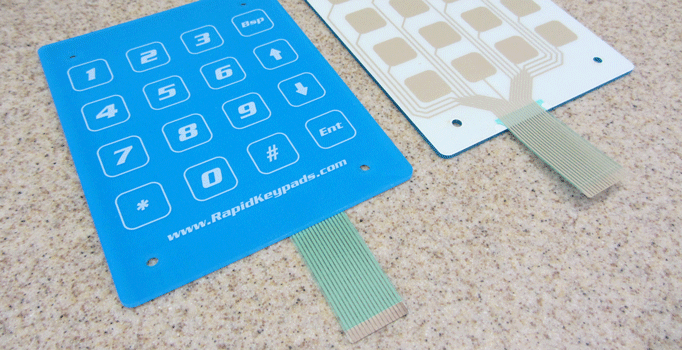 Rapid Keypads can also provide the necessary electronics on a custom PCB or provide you with the IC and schematic so that you can integrate it directly onto your product's pcb. You could also use our off-the-shelf capacitive touch electronics solutions available in our e-store. If electronics are required, Schematic Design - PCB Layout, release design to fab. 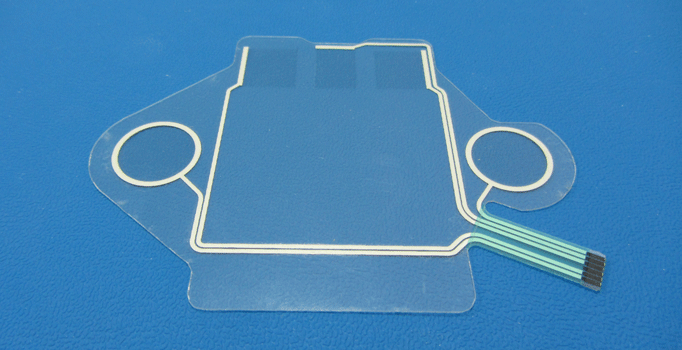 If electronics are required Assemble / Solder PCB Components with our pick and place equipment. Capacitive touch panels are very sensitive to interference caused by the surrounding electronics. Therefore it is important that the prototype keypad be tested in a fully assembled functioning product. Our tools can help identify noise that is generated by the surrounding electronics. The information collected during these tests can be used to make the system more robust. It is also important that the buttons sensitivity be tuned to the correct fascia material and thickness. We prefer having a full functioning unit to test and tune the capacitive touch keypad. If this is not possible, having the parts that are closely related to this touch panel will help a great deal. Once the first article is approved, the remaining prototype units are built and shipped. Based on the approved article we generate the final bill of materials. From this bill of materials we can now quote the true production cost. Once the production quote has been approved and purchase order has been accepted, we prepare for production. An accurate delivery schedule will be available once we order the production materials / components from our suppliers. We will develop a test fixture that will be used to comprehensively test each of the assembled touch panels. We will also manage each step of production to ensure there are no unnecessary delays.